Belfast City Council have accepted in writing that their bonfire injunction could NOT prevent the lighting of bonfires on 11th July. This assertion, originally put forward by the East Belfast Community Initiative, blew a hole in Sinn Fein’s attempts to stop all bonfires. It appears from this assertion that Belfast City Council had sought to intercept materials in transit. In relation to the council decision to appoint an independent contractor to carry out these tasks, the City Solicitor further reveals that council approved this decision in June 2017 and the report for this meeting is “restricted” despite the huge public interest in relation to this issue. 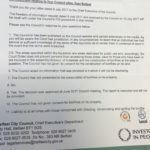 The Council further revealed that the decision to target the sites in east Belfast was taken after information was provided to Council. Information which they say they will “not be disclosing”. There is no further explanation as to why this information is deemed so secret, as is the identity of the individuals that provided it. 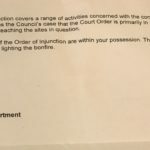 Despite for many years running a Bonfire Management scheme, the City Solicitor also claims that the Council “has not given consent for bonfires on its property”. There is no explanation as to why Council therefore made conditions in relation to bonfires a pre-condition for accessing funding. Belfast City Council have extended by 20 working days the time allowed to consider whether to release information in relation to the targeting of cultural expression zones in east Belfast in July. The Freedom of Information Act 2000 allows a public body to extend the time limit by up to 20 days to consider whether the information should be withheld as a matter of public interest. A copy of the council’s policy for dealing with requests to enter their land, pursuant to the assertion within their injunction that access would not be permitted without permission. A copy of all notes, minutes and attendance lists in relation to all meetings held to discuss injunctions targeting east Belfast cultural expression zones. Unionist Voice will continue to report on all developments. You can read our exclusive account of the secret meeting targeting cultural expression zones HERE. 80 Responses to "EXCLUSIVE: Belfast City Council forced to reveal key details of July injunctions"
What i do not realize is actually how you are not actually much more well-liked than you might be now. You’re so intelligent. You realize therefore considerably relating to this subject, produced me personally consider it from numerous varied angles. Its like men and women aren’t fascinated unless it is one thing to do with Lady gaga! Your own stuffs nice. Always maintain it up! I would like to thank you for the efforts you have put in writing this website. I am hoping the same high-grade site post from you in the upcoming as well. Actually your creative writing skills has encouraged me to get my own website now. Really the blogging is spreading its wings rapidly. Your write up is a great example of it. It’s appropriate time to make some plans for the future and it’s time to be happy. I’ve read this post and if I could I wish to suggest you few interesting things or tips. Perhaps you could write next articles referring to this article. I want to read more things about it! I am commenting to let you be aware of what a great discovery my cousin’s daughter had studying your web site. She mastered such a lot of things, including what it is like to have an ideal helping style to have others without difficulty know just exactly certain advanced issues. You undoubtedly exceeded our own expectations. Many thanks for displaying such insightful, trusted, revealing and also unique tips on that topic to Evelyn. Somebody essentially help to make seriously posts I would state. This is the first time I frequented your web page and thus far? I surprised with the research you made to make this particular publish amazing. Magnificent job! Great post. I used to be checking constantly this weblog and I’m impressed! Extremely useful info particularly the ultimate section 🙂 I take care of such info a lot. I was seeking this particular information for a very long time. Thanks and best of luck. I am curious to find out what blog system you are utilizing? I’m experiencing some small security issues with my latest blog and I would like to find something more safe. Do you have any recommendations? You actually make it seem so easy with your presentation but Ifind this topic to be really something that I think I would never understand.It seems too complicated and extremely broad for me. I’m lookingforward for your next post, I will try to get the hang ofit! him/her to visit this website, Keep up the fastidious job. Along with everything that appears to be developing inside this specific subject matter, your perspectives are actually very exciting. Having said that, I appologize, but I do not give credence to your whole theory, all be it radical none the less. It would seem to everybody that your opinions are generally not totally rationalized and in fact you are yourself not even fully certain of the assertion. In any event I did enjoy reading through it. Hiya, I’m really glad I have found this info. Nowadays bloggers publish only about gossips and net and this is actually annoying. A good web site with exciting content, this is what I need. Thanks for keeping this web-site, I’ll be visiting it. Do you do newsletters? Cant find it. Thank you for another excellent post. Where else could anybody get that kind of information in such a perfect way of writing? I have a presentation next week, and I’m on the look for such information. Attractive section of content. I just stumbled upon your website and in accession capital to assert that I acquire in fact enjoyed account your blog posts. Any way I will be subscribing on your augment or even I success you get admission to persistently fast. Hello there, just became alert to your weblog via Google, and found that it is really informative. I am gonna watch out for brussels. I’ll appreciate if you happen to proceed this in future. Numerous other people might be benefited from your writing. Cheers! I’ve been exploring for a little bit for any high quality articles or weblog posts on this kind of area . Exploring in Yahoo I eventually stumbled upon this site. Reading this information So i’m glad to exhibit that I have an incredibly good uncanny feeling I came upon just what I needed. I most indisputably will make certain to do not overlook this web site and give it a look regularly. Hello there, just turned into aware of your weblog via Google, and found that it’s really informative. I am gonna be careful for brussels. I’ll be grateful should you proceed this in future. A lot of other people will be benefited out of your writing. Cheers! I would like to thank you for the efforts you have put in writing this blog. I’m hoping the same high-grade website post from you in the upcoming also. In fact your creative writing abilities has inspired me to get my own site now. Really the blogging is spreading its wings fast. Your write up is a great example of it. Good day! I simply wish to give an enormous thumbs up for the great information you may have right here on this post. I will be coming back to your blog for more soon. This web site is really a stroll-by for the entire info you needed about this and didn’t know who to ask. Glimpse right here, and you’ll positively uncover it. Howdy! I know this is kinda off topic but I’d figured I’d ask. Would you be interested in exchanging links or maybe guest authoring a blog post or vice-versa? My site addresses a lot of the same topics as yours and I think we could greatly benefit from each other. If you happen to be interested feel free to shoot me an e-mail. I look forward to hearing from you! Excellent blog by the way! Hiya! I simply want to give a huge thumbs up for the good data you might have here on this post. I will likely be coming back to your blog for extra soon. Valuable information. Fortunate me I discovered your web site by chance, and I’m shocked why this coincidence didn’t came about in advance!